When the cake is cooled, remove the paper and place on cake on a serving plate, flat side upwards, Spread with the jam and a little of the butter cream. Place the other cake on top. Spread the remaining butter cream all around the side of the cake. Place the sugar sprinkles on a plate or shallow bowl, then pick up the cake and roll the sides of the cake in the sprinkles. Place on a serving plate. Mix the fondant icing sugar with just enough water to make a thick icing that just pours. 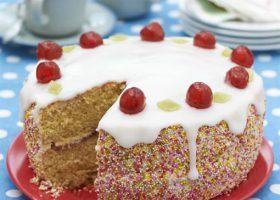 Spread it over the top of the cake to completely cover it, then decorate with cherries and jelly sweets. This cake will keep in a cake tin for up to 1 week.